All our custom designed small block Ford camshaft profiles are developed per your specific application. No repackaged catalog camshafts or reground stock cores like our competition. Every facet of your build is taken into consideration when the profile is developed. Whether you're building for the serious street, race track, endurance or off road, we can handle it. Dual purpose grinds require long tube headers and free flowing mufflers & exhaust system. The race grinds will not work with factory EFI computers without modifications and professional tuning. Carbureted application will normlly require a tuner carb from Bigs Performance, Pro Systems or the newer Holley HP series. Completion of the FTI CAM TECH form required. All the custom "Race Series" camshafts are CNC ground on 5160 billet steel cores and will require an OEM steel or coated melonized steel distributor gear. Drilling the front lifter gallery oil plug to spray lubricant onto the gear meshing area is highly recommended. Lubricants with a high zinc content required for long-term endurance for any camshaft core. These custom camshaft profiles are available with complete valvetrain packages containing matching valve spring kits, billet timing sets, hardened push rods and roller lifters. Gaskets, fasteners and anything else required to complete the project are also available through the web site. Contact us for any package deals. Gross Valve Lift Range: .450"/.700"
I originally bought a cam hydraulic from Ed in 2104 and loved it. I made 870/720 rwhp in my supercharged 94 Mustang. One of my lifters failed last year and chewed up my previous FTI cam and I didn’t hesitate to purchase another from him. I made some minor gearing changes and Ed updated the cam profile accordingly. Great product and awesome customer service...highly recommended!! Contacted Ed about what I was looking for in my 408 stroker engine, and he ground me a hydraulic roller cam to match what I was looking for. Just got it on the road earlier this week and am super happy with the cam. No idle issues, and just a mean powerband. Great work on this! Will use again! Best in the business! Great communication through the whole process and the cam works awesome. Got a custom hydraulic roller camshaft build by Ed for my 393W Ford stroker, I couldn't be happier, it sounds amazing and performs just like I wanted, I still can use my power brakes and it doesn't buck down it the lower rpm's Thanks Ed you're the man. I bought a custom billet cam from FTI two years ago. I had a lifter failure on my first outing this year and wiped out the cam. I contacted Ed because I needed a replacement for my race in 12 days. He went above and beyond to get the cam ground in record time. I got the car together in time and won my grudge races! My Pinto also ran a new personal best of 9.38 @ 145 mph. Don't waste your money on a shelf cam. Go to the best if you want everything out of your combo! Ed cares and will help you out! I bought a FTI custom hydraulic roller cam for my 408w. This FTI cam beat my other popular off the shelf cam BY FAR. Every aspect of the FTI performance is better than the off of the shelf cam . Ed had very clear communication and delivered! Plain and simple, the best. Great product, great service, great value! I bought a custom hydraulic roller cam and all valvetrain parts, including heads, from Ed last year for my '65 Ford 289 build. All parts were of excellent quality, Ed provided really good service and answered all questions professionally. My 289 now runs GREAT! I can highly recommend this company. 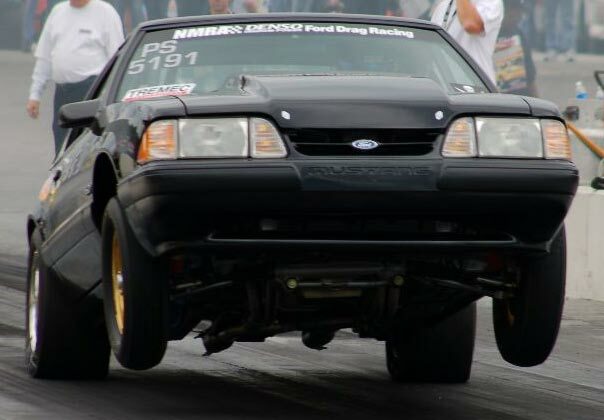 Awesome cams that make plenty of power, consistent ET's, and can still run power brakes! Better then off the shelf, by far! I recently installed a new top end onto my stock short-block, 91 GT Mustang, and compared to two other fuel injected fox bodies I've ridden in that had an aftermarket HCI, mine will out-run both by quite a bit. Both the other HCI's were complete kits, and both ran good, but I believe it's the custom cam that has made the difference on this build. Click the button below to add the FTI Custom HR/SR Roller Camshaft Ford - Billet to your wish list.